Keeping clever WiFi names also mean that they should be easily understandable, it describes your thought process, your ideas that are manufactured or born to come up with like that. To make it easy for you, we have compiled a list of few clever WiFi names, which are definitely in a clever sense and are ready to use. So let’s get started! Here, we have given you some of the Best 130+ Clever WiFi names for your Router, Network SSID which will surely show your cleverness to your friends as well as to your neighbors. 1 1/7 of our lives are Mondays. 7 And they lived happily and often ever after. 15 Buy a new smartphone? 26 Free Wi-Fi are awesome, I wish everybody had one. 27 Free Wi-Fi for everyone. 45 I am Wi-Fi Use me. 48 I me myself and I . 53 If a person really wants to live, then only help is free Wi-Fi. 54 If the music is too loud – most probably you’re too old. 60 It Hurt when IP. 69 Life is short. Smile while you have free Wi-Fi. 70 Live as someone has left an open gate for you. 71 living is good. But I’d prefer to have the good Wi-Fi connection. 91 Nothing poisons life more than Free Wi-Fi. 101 Smart Wi-Fi for smart persons. 103 Stop polluting the environment. 104 Stop using our internet. 111 This LAN is your Lan. And this is my Lan. 119 Use this one mom. 121 Value the Wi-Fi! It’s the substance that life is made of. 138 Your device is cracked. These Wi-Fi names would have undoubtedly attracted you and if you think whether to choose it or not and perhaps your friends will come to know that this idea behind your Wi-Fi name was not your original idea but was taken from this site, then worry not! We have an alternative thought about it. Firstly, you can modify them as per your wish as these Wi-Fi names are free to use. Secondly, you can definitely brag about it, that it was initially your idea and you have shared your opinion with us! Bragging sometimes is definitely good for health you know! Well, the above two points would have convinced you to use these Wi-Fi names, if still not, then these names will still be here and you can come back whenever you have a second thought about it. If you use, we insist you spread a word to your friends or colleagues if they are also looking for a website that has some pretty cool stuff about Wi-Fi names. 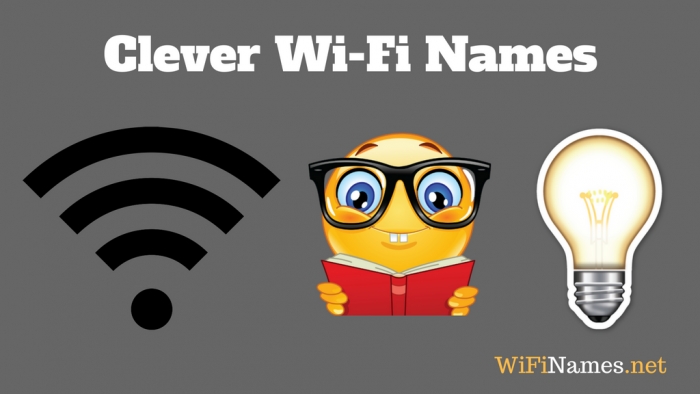 So what was your favorite clever Wi-Fi name? Let us know in the comments section below!